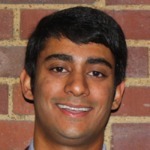 Ankur Doshi is a recent graduate from Vanderbilt University in Nashville, Tennessee. Originally from Atlanta, Georgia, he double majored in Neuroscience and Economics. During his time in college, Ankur was involved in many diversity, service, and community-building activities. He was a Resident Advisor for three years, co-president of the university’s Habitat for Humanity chapter, and co-chair of MOSAIC, an organization that works with admissions counselors to increase campus diversity. He spent many of his breaks volunteering in various social issues, from homelessness in California to special needs children in New Hampshire. As someone who is interested in economic development and healthcare, he spent a summer in Zambia working at a nonprofit global health organization. He hopes to use his skills and experiences from college to improve healthcare in communities around the world. His hobbies include dancing, playing sports, reading, and visiting friendly people and places. In Fall 2013, Ankur will be attending medical school.